The shiniest software application in the world, shipped on time and under budget, is a failure if it doesn't make someone's job easier. Failures cost us customers and money. How can we design software that our customers want to use and that will reduce our cost of failure? As a new manager it's easy to fall into the trap of taking on more of your team's responsibilities than you should. Learn how to guide your team to success by stepping back and letting team members solve their own problems, learn from their mistakes, and most of all do what you hired them to do. A mission statement is supposed to guide and inspire the members of an organization as well as define the organization's purpose, the business it is in, and its responsibilities to its clients. Is your statement sending the right message? We've all heard Einstein's definition of insanity, and it definitely holds true in software development. We "are" going to make mistakes in product development, but root-cause analysis can help us understand those mistakes and be proactive in not repeating them. Risk management is an illusion. We must recognize that software projects are inherently risky and admit to ourselves that it's not the known problems that are going to cause our projects to fail. It's the risks that are unmentionable, uncontrollable, unquantifiable, or unknown that make projects crash and burn. 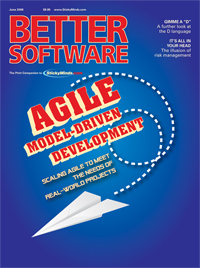 Despite what you might have heard, modeling is an important part of agile software development. Find out how agile model-driven development fits into the overall agile development lifecycle in a lean and streamlined manner and can improve productivity on your team. In his final pitch for the D programming language, Chuck brings to "closure" (pun intended) a running example from previous Code Craft articles while exploring some powerful features of the D language. Drawing from his experiences while learning to drive, Michael applies lessons he learned from written rules, experiential learning, and the advice of mentors to teaching new testers some valuable skills.